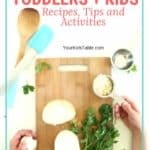 Please note this post contains affiliate links that help support the information I share at Your Kid’s Table. 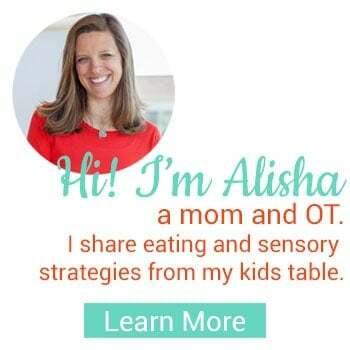 Today, I want to cover a daily problem many of you are dealing with… navigating family meal times with a picky eater. 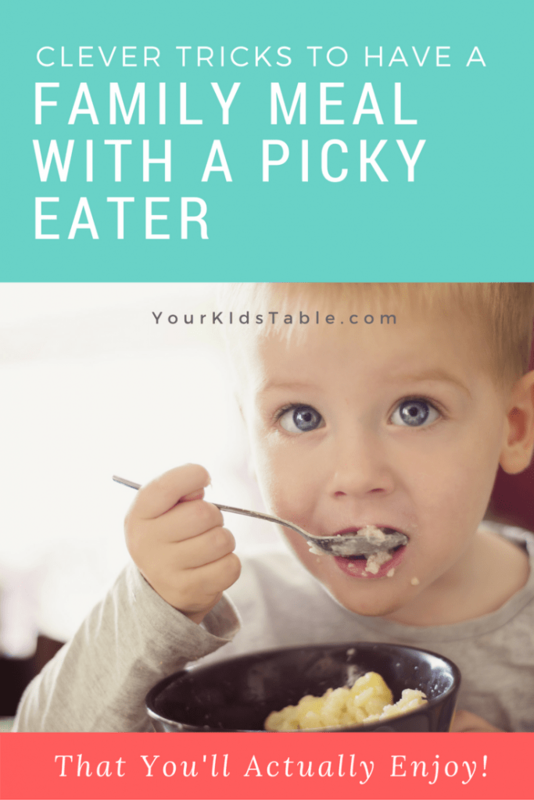 Most parents with picky eaters want to give their kids what the rest of the family is eating, which is often something delicious and nutritionally sound. But, they know their “picky eater” won’t even consider trying it. Frequently, parents find themselves preparing a separate meal for this child. I know that parents feel stuck and while they don’t want to be short order cooking, they also don’t want their kids to go to bed hungry, a horrible thought especially for younger kids. So, what’s a parent to do? It is a question I get asked very often! with me. Make sure you get a seat before they are filled up and share it with your friends and family on Facebook, Instagram, and Twitter, because almost everyone has a picky eater they need help with. If you’ve read the Eating Basics tab in the menu bar or any one of a large variety of articles I’ve written here, then you know I consistently preach 2 things parents must follow to begin to see progress, without them any other efforts will most likely not get results. 1. Meals must be spaced at least 2.5-3 hours apart with nothing in between but water. 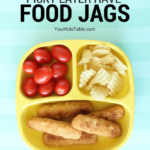 This ensures your child will have an appetite when they sit down to the meal. 2. Always serve at least one preferred food (aka: something they will actually eat). I’m already ahead of you because I know what your next question is… “What if they only eat a handful of foods?” The short answer is that you will begin with rotating at least one of those foods at each meal. Now, I know it isn’t always that simple, and surely through my private and community practices I have seen a wide range of food preferences. Plus, if you follow along here, you know that I am dealing with this personally as a parent also. Believe me, I get it! My goal in this post is to show you exactly how to make reasonable accommodations for the picky eater in your life without losing your sanity or sacrificing the quality of your other children’s eating. 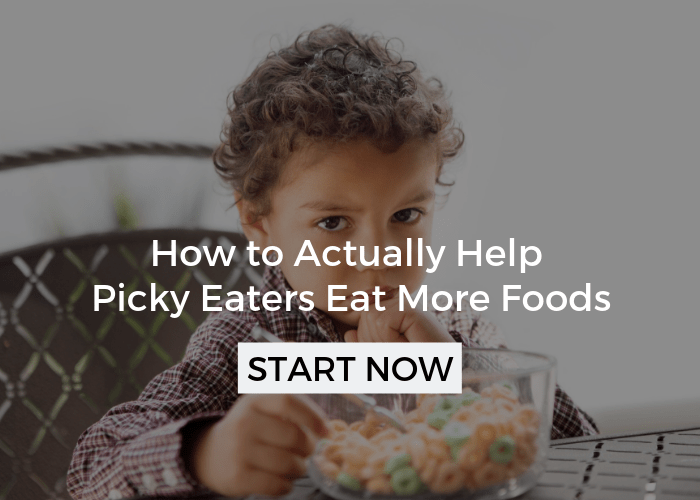 With that being said, this post isn’t going to talk a lot about how to improve the picky eater’s variety. 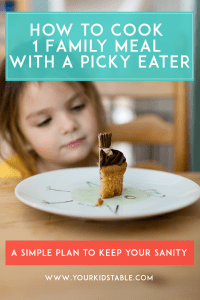 Don’t be disappointed though, if you are looking for specific strategies to get your picky eater eating more, there is a ton of info in other articles I’ve written. See the Picky Eating section under the Article Index tab in the menu bar. Although we have come a very long way with my son, there are still some foods we regularly eat that he doesn’t. I’m going to be really honest here and say that is okay with me most days. We have a system in place that keeps meals positive and we usually encourage him to interact with the food in a positive way, but as a mom I don’t always have the energy to work on him eating something new, nor do I constantly want him to be the center of attention at meals for his and and everyone else’s sake. I can rest easy because I know he is still being exposed to these non-preferred foods, but also has something to fill his tummy enough until the next meal. 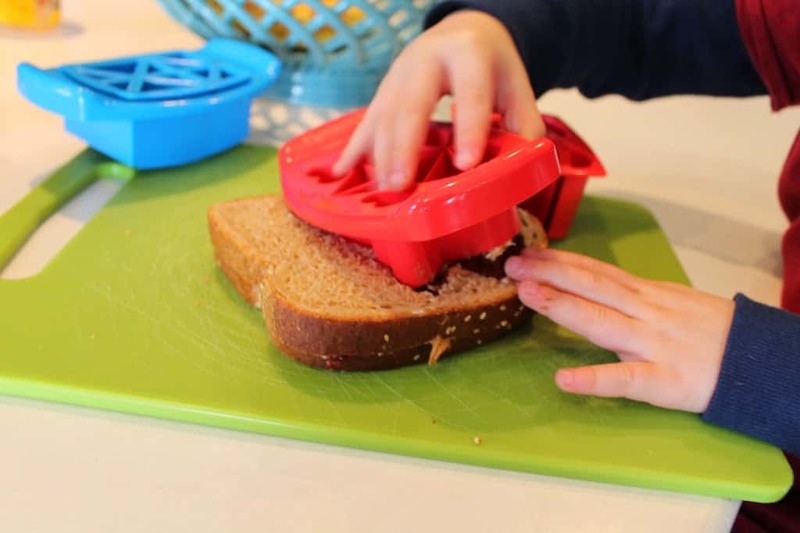 I’m going to use Isaac, my son, as an example of how I manage my family meals so that you can draw some similar parallels with foods that your child likes to eat. It takes some pre-planning, but it is worth the effort by the time kids are coming to the table. Likes: Carbs of any kind. There isn’t a bread, chip, or cracker that he turns down, and I’m careful to maximize exposing him to a wide variety in this category of food. He also consistently eats cheese, nuts, desserts, and most fruits. Challenges: He struggles with most meats outside of bacon, ham, and the occasional chicken or fish nuggets. Mixed foods, like casseroles, potatoes (other than french fries), and veggies (other than raw carrots) are hard for him. Obviously, I could just serve bread every night with a meal, but I don’t want that to become something he assumes will always be there. I make a concerted effort to rotate the foods he likes as part of our dinners. If your child only has a few foods they consistently eat, you may only be able to do this once a week. On the other nights that we are having a casserole or mostly foods he will eat little to none of, I make sure I rotate in one of those additional sides that I likely wouldn’t have served. For example, the other night I made an enchilada casserole that everyone else enjoys, on the side I served tortilla chips and raw carrots (two preferred foods) that I otherwise wouldn’t have, but were little effort and didn’t detract from the meal for anyone else. Whenever I can, I try to have the additional Isaac food compliment whatever the rest of the meal is. I also don’t let the kids realize that this food is mostly for Isaac, I put it out for everyone. I’m also willing to deconstruct the casserole and serve some of it separately. This doesn’t always work logistically, but when it does I use it. Another valuable element is to allow kids to serve themselves, as it gets them interacting with foods they may not eat (See my post on Serving Family Style). I would suggest making it a rule that everyone has to take some of everything even if it is just a small spoonful. It is their choice if they eat it. However, since picky eaters just want their preferred food, do you allow them just to eat mass quantities of it and ignore all the other foods? The answer isn’t a straight forward one. Here are some more examples of dinners we’ve had that I’ve added a preferred food to. Again, notice how I’m trying to have it go with what we are eating and that I’m maximizing every category of food he eats. I’ve highlighted the food I’ve added in. Isaac may eat some of these other foods that aren’t on his preferred list, but if he doesn’t, I know that there are enough other options there for him in case he doesn’t. If for some reason he decides to not eat even his preferred food, that is on him as long as I know we have waited that 2.5-3 hour mark I mentioned at the beginning of the post. I make sure to remind him before he leaves the table that there won’t be any food until the next meal, and I follow through. Remember that I wouldn’t serve all these “challenging” meals in a row, I alternate with meals that include several preferred foods so that he is meeting more of his nutritional needs. 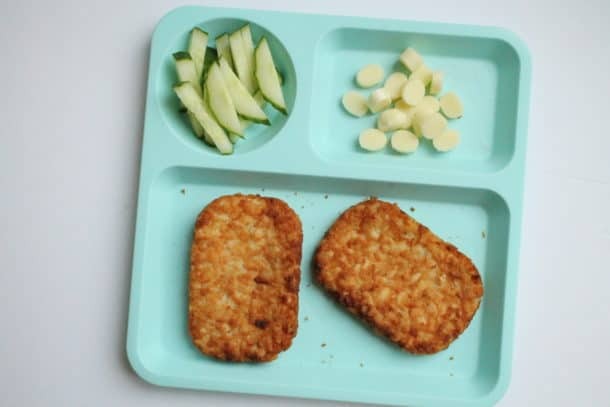 Ideally, at any meal I would like a child to eat an appropriate portion of a fruit/veggie, carb/starch, and protein. At the same time, you don’t want to go the other way and be serving 10 things for dinner trying to make it all seem like the same meal. At times, I have to let go of the fact that he isn’t eating a fruit or veggie at a particular meal. I can do this because I’ve offered one and he has chosen not to eat it. Of course, I don’t want this to go on meal after meal, so I will try to make up for it in either the meal before or after by serving something preferred in the category (usually fruit/veggie) that he is lacking. 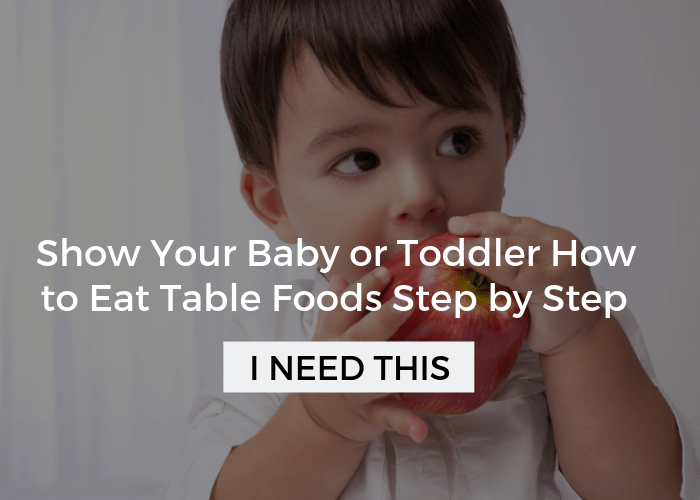 If your child is in the problem feeder category it would still be helpful to follow these suggestions, but you are going to be a lot more limited in terms of variety of preferred foods. 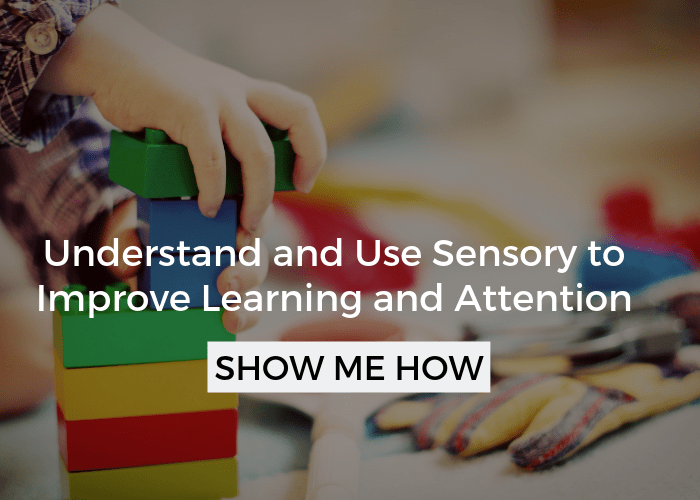 I would highly recommend focusing on increasing variety at the same time, more on that here and here, and/or seek out help from a feeding therapist. Lastly, since I meal plan for a whole month ahead of time, I try to remind the kids earlier in the day what we are eating that night for dinner so there isn’t any disappointment or surprise. As much as I can, I try to get the kids to help cook or prepare some part of the dinner, especially when it is something new or a casserole. This is a great time to use those FunBites, as well. 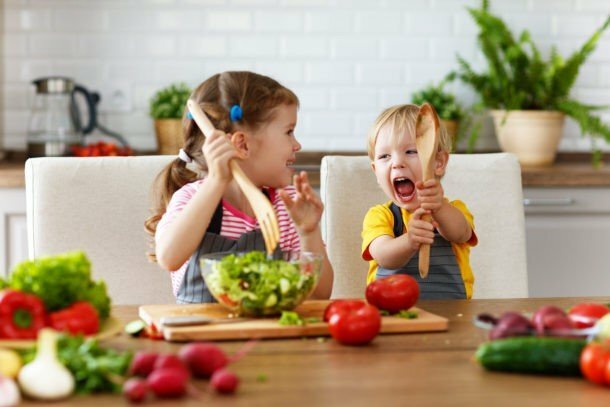 If you haven’t already, don’t forget to sign up for the FREE 3 Keys to Finally Turn Your Picky Eater Around Workshop!!! I totally get it Kristina! It’s soo hard!! Have you checked out my picky eating workshop, it’s free and I teach your my basic core steps, which I think are the most important for you to learn! The not going to bed hungry thing is what is hard for me. We read books in bed as part of our bedtime routine and there are times that he will say he is hungry while we are reading. I typically either to respond to it and keep reading or say something of waiting until we are done with books. I didn’t want it to become a tactic for delaying bedtime. That said, when he reminds me or does come out of his room saying that he is hungry I have given him a couple club crackers and that usually satisfies him and goes to bed…..so maybe it is a delaying bedtime tactic 😉 But I’m working on meal planning to start implementing all of your routine and preferred foods/non-preferred food tactics and wondering how you would handle bedtime on a night where we eat normally around 6pm and bedtime is 7:30, when he is saying he is so hungry at bedtime, especially if he chose to not eat a preferred food at supper. Do you get a plate of the foods that were served at supper? Oh Dani, that is hard! I’d make sure the meal is over by 6:30 for him and then serve him a quick snack before you start your bedtime routine- if it gives you peace of mind! I’d check with your dr to see how he is with weight/height as well. I think the other changes your making will help end this for you as well though! You’re doing good things here, I know it’s hard, but you’re going great!!! This is exactly where my problem lies. My two year old daughter will sometimes just ask for more and more of her preferred food, usually a type of berry. She will then ignore the other food on her plate, only eating that one food. Should I offer unlimited quantities of the preferred food so she will not be hungry? Under the section “helpful tips” above, click the links “here”. 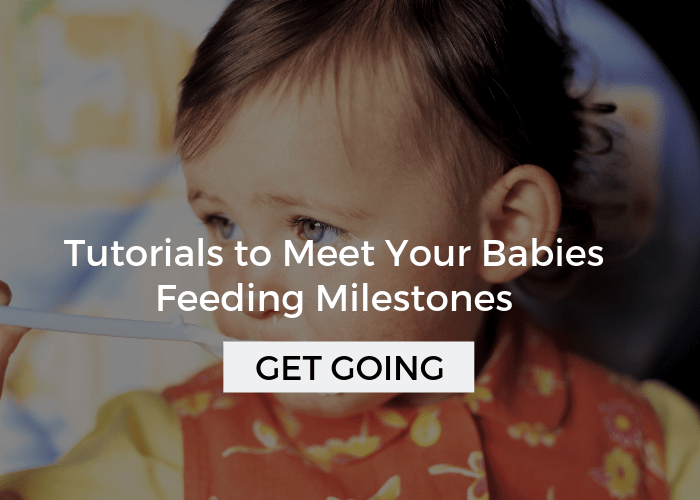 They both take you to posts where I write about the bulk of how you can get your kids to try new foods. When she asks for more take this as an opportunity to encourage her to “explore” her other foods. Depending on how severe her picky eating is, it may be a really big step to just touch the food (I talk more about this in the article I referenced). When she has interacted with the food some I would say it is okay to give her more of her preferred food. I make a judgement call at each meal when I need to draw the line- usually around 2-3 servings.